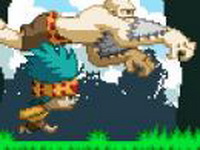 Build a strong party of warriors to defeat each opponent and the final boss. Each unit requires a certain mount of prada points when selected for battle. You can revive warriors by sacrificing Turangamassa Points. Turangamassa and prada points increase after victory. Warriors won’t die if defeated in training. Only one will have to stay! You are a pilot of the Military Air Forces. Become a winner in a duel with an experienced enemy. As the pilot of the only space worthy craft in your space reef, you alone are responsible to bring your reef from agricultural productivity, toward industrialization and long term sustainability…take whatever you want from earth. Defend the Allies from the scourge of Europe. Kill as many german soldiers as you can! Squirrel goes aero. Collect gems and avoid the bomb. Panda is constantly starving and loosing health: The goal of the game is to kill and eat everyone on each level before panda's life runs out. You can walk around by moving the mouse or pressing the arrow keys, and attack by clicking or pressing space. Hold mouse/space button longer to perform different types of attacks. From time to time, you may want to relieve yourself, for extra health gain.To do so, eat enough to be at least half full, then stand still for a few moments. To refill your health just keep eating plenty of greens and proteins, but try to avoid food that's bad for you! In Bimmin 2, players reprise their role as Bimmin, the caveboy who's always on the move, and this time is no different. Armed with a sleeker look and new moves, Bimmin strides and slides his way through the world, collecting fruits and meats along the way … and for those times where a little more muscle is needed, Bimmin can call on his new partner Roc to bash and smash his way through any obstacle. Very addicted cute pinball game, you're mission is to destroy a group of virus using a pinball ball.